Home Features Receptacle Grades: What Do They Mean? Receptacle Grades: What Do They Mean? In today’s world there are so many different types of receptacles to choose from—straight blade, locking-type, and pin and sleeve. The variety of straight blade receptacles offered by manufacturers alone is staggering—in fact, wiring device manufacturers produce and market more than a 1,000 different types. Differences include electrical rating, color, style, sizes, and configuration. Receptacles are marketed using terms such as general grade, specification grade, heavy duty, industrial grade, commercial grade, residential grade, hospital grade, specialty grade, and fed spec. There are, however, only four receptacle identities that are specified in the Standard for Attachment Plugs and Receptacles, ANSI/UL 498 and CSA CAN/C22.2 No. 42-99, General Use Receptacles, Attachment Plugs, and Similar Wiring Devices. 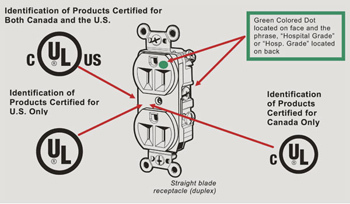 In these standards, straight blade receptacles are assigned four grades: general use, hospital, federal specifications (fed. spec. ), and combination hospital/fed. spec. Each grade has its own distinct marking requirements. The standards do not acknowledge the other receptacle marketing designations (e.g., commercial grade or heavy duty). 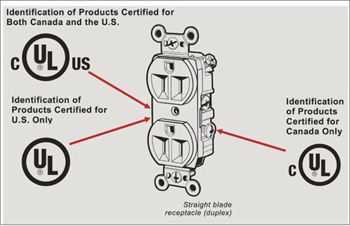 These designations represent the manufacturer’s attempt to assist in the selection process of an appropriate straight blade receptacle based upon the intended usage and demands that may be placed on the device. While they may be helpful to the user, these designations generally have no impact on the safety requirements applicable to the receptacles. Marketing designations are different from design features. Manufacturers also offer straight blade receptacles with a variety of special features. These features may include resistance to environmental conditions, tamper resistant construction, or isolated ground. For example, an isolated ground straight blade receptacle is offered in all the different grades—General Use, Hospital, Fed. Spec., and combination Hospital/Fed. Spec. The standards require additional investigation to address compliance of these special receptacle features. General use receptacles are the most common found in the marketplace in both the United States and Canada. Receptacles that are found to comply by UL with safety standards within the U.S. and Canada are identified below. General use receptacles are intended to supply a variety of electrical loads in general use, and are tested for this variety. For General use receptacles, matching the plug configuration with the receptacle configuration is the key step in determining if the receptacle can handle the load. In this case, the receptacle has been evaluated to ensure it can handle the load whether it is a lamp, vacuum cleaner, heater, or other product. In addition to complying with the general use requirements, hospital grade receptacles are specially designed and are subject to additional requirements of the standards. These include additional grounding reliability, assembly integrity, strength and durability. Hospital grade receptacles are offered in 15 A and 20 A straight blade of the ANSI/NEMA WD6 5-15, 6-15, 5-20 and 6-20 configurations. They are intended for use in accordance with the National Electrical Code, ANSI/NFPA 70, Article 517 (Health Care Facilities) in the United States and the Canadian Electrical Code, Part 1 CAN/C22.1.02, Section 24 (Patient Care Areas) in Canada. Hospital grade receptacles have the same markings appearing on general use receptacles, but include additional markings denoting their intended use. These additional markings include the phrase “Hospital Grade” or “Hosp. Grade” appearing on the back of the receptacle (where visible during installation) and a green dot located on the face, visible after installation with a cover plate secured as intended. UL does offer listing to a special locking-type receptacle rated 20 A, 125 V. The identification is very similar except it is marked “Hospital only” with no green dot appearing on the face. In addition to complying with the general use requirements, fed. spec. receptacles have also been investigated for compliance with US Federal Specification W-C-596, “General Specification for Electrical Power Connectors.” The Federal Specification W-C-596 is a document produced by the General Service Administration of the U.S. Federal Government. It identifies construction features, marking specifications and performance requirements beyond the requirements of the safety standards, for the purpose of durability and service life. Underwriters Laboratories is authorized to apply the federal specification verification mark. The fed. spec. was created as a means to help government procurement personnel in obtaining the correct receptacle from suppliers. The fed. spec. details configuration, electrical rating, type (single outlet or duplex) and even including the color of the outlet face, assigning a common descriptor. The receptacle industry adheres to this identification scheme in lieu of their usual catalog designations to facilitate government purchases. 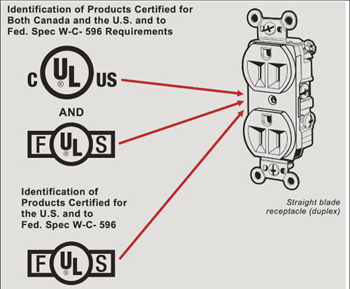 Receptacles are identified by the federal specification verification mark, capital letters “F” and “S” each in a wing on either side of the UL Listing Mark. The manufacturer may also indicate the federal specification number “W-C-596F” or “W-C-596G” with the federal specification part number which consists of the appropriate specification sheet and dash number described in the specification. These may appear on the device or on the smallest container in which the device is packaged. Other wiring devices eligible for fed. spec. rating include attachment plugs, cord connectors, (cable outlets) receptacles and male inlets. They are offered in both straight blade and locking- type configurations and an electrical rating ranging from 120 to 600 volts with current ratings up to 60 amperes and a frequency rating of 50/60 hertz. As the grade name indicates, hospital grade/fed. spec. receptacles have been investigated for compliance with fed. spec. hospital grade requirements. They too are identified by the capital letters “F” and “S” flanking the UL Listing Mark. The manufacturer may also indicate the additional federal specification information on the device or on the smallest container in which the device is packaged. The phrase “Hospital Grade” or “Hosp. 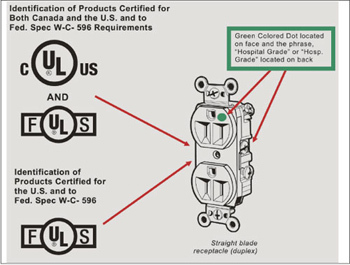 Grade” will appear on the back of the receptacle (where visible during installation) and a green dot will be present on the face, visible after installation with a cover plate secured as intended. Although they seem to visually appear the same they are not. Each is investigated to a different set of performance and construction requirements. For example, a fed. spec. receptacle is not subjected to the abrupt plug removal performance sequence of testing, whereas a hospital grade/fed. spec. is subjected to this performance test sequence. So, as a receptacle is being chosen or approved for an application, the decision making process should begin by identifying the appropriate grade (e.g., general use) and features (e.g., tamper resistant) that conform with the safety standards and codes, and suit the particular installation. This information is different than the manufacturer’s designations (e.g., heavy duty) intended to meet the user’s preferences for the application. For additional information, please visit our web site at www.UL.com. Next articleDo You Know Where Your Cables Are Tonight?